Opening move in a game of Mancala. 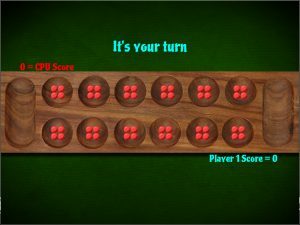 Give my new Mancala game a twirl and see what you think. I hadn’t heard of Mancala until a couple of weeks ago when my young daughter proudly announced that she’d been playing the “plonker plonker” game around her friend’s home… Turns out it’s actually a game called Mancala! The rules turn out to be pretty simple which made me think about creating a version in Gamemaker to figure out a little more about turn-based games, board-type games and so on for some future project ideas. For those of you like me that had never heard of it, Mancala is of African origin, it’s been played in many many variants for even longer than a game of Monopoly lasts. The board that I’m using has 12 round holes (also called pots or pits) and 2 oval ones at the ends called Mancalas. The six round pots closest to the bottom of the screen are your (P1) pots and the six at the top are your opponent’s (CPU). The oval pot on the right hand side is your ‘Mancala’ (or store) and every stone in here counts towards your score; the one on the left belongs to the CPU. In all versions of this game, you get another turn if your final piece lands directly in your Mancala. Simply select another of your pots with at least one stone in. If you turn OFF simple mode in the settings – When your final stone lands in any pot (not Mancala) already containing stones, pick up all the stones in that pot and continue around the board. See below for further details. Players continue taking turns until ALL six pots on either side are empty, this marks the end of the game. At this point, some of the pots on the other side of the board will contain stones, these should be collected and placed in the Mancala for that side. The winner is the player with the most stones in their Mancala at the end of the game. 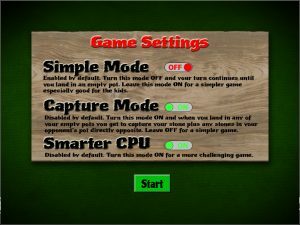 Simple Mode – When OFF, play continues each time a player lands in any pot (not the Mancala) with stones. These are picked up and play continues anti-clockwise until landing in the Mancala (take another turn) or an empty pot (other player’s turn). Capture Mode – When ON, a player landing in an empty pot on their own side captures any stones in the opponent’s pot opposite. The captured stones and the capturing stone are placed in the player’s Mancala. 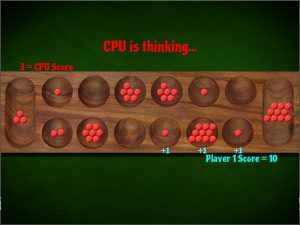 Harder CPU – When ON, the player is slightly smarter for a better challenge (though still pretty stupid on the non-simple game mode). For far more detailed, probably more accurate and definitely easy-to-understand information visit Mancala on Wikipedia. As always, please have a go and let me know what you think. This one seems to be a little more temperamental online and so the testing I’ve done on my own PC isn’t of so much help so if you find any bugs please let me know. -Touchscreen ‘taps’ work but the view is too small on a mobile. -View implemented to scale on mobile device. Partial fix. -Gamemaker didn’t want to play nicely in HTML, updated FP numbers. -Several options for different rules (there are more than I can include). -Two CPU levels, neither of which are yet very smart.